Summer time is a beautiful season to get married to the one you love. Thoughts of blue skies above and the sun’s warm rays hitting your skin would be the perfect additions to make your wedding day extra special. These two pieces add a subtle touch of nature to your bridal look with the flowers and butterflies. This style of dainty jewellery is perfect for when you want it to enhance yet not steal the limelight from your dress. Adding a dash of pastel shades and some florals is a gorgeously girly look that is reminiscent of a summer’s day. These would work well for bridesmaids too! 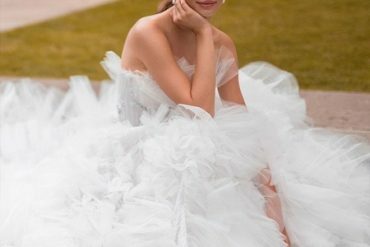 Many traditional brides opt for a tiara and veil, however if you are going for an understated summer look these are some lovely alternatives. These will work perfectly with a side bun or beachy waves. You want to choose a gorgeous pair or shoes, especially if you are opting for a shorter dress. Whether you can last in heels or want to choose flats, here are two options we love. Even being a bride you will still want a handbag to keep your essentials in. Make-up, mobile phone and tissues are a must have, and you can keep them in something like this.